Mihály Munkácsy was born in Munkács in 1844 as Leo Michael Lieb, but from 1868 he changed his name to Munkácsy. The painter rise to himself from a depth, from a carpenter he became famous painter, who conquered the world with his huge canvasses. He was a romantic realist painter who prepared the compositions on large canvases with various figure types and toolbars. 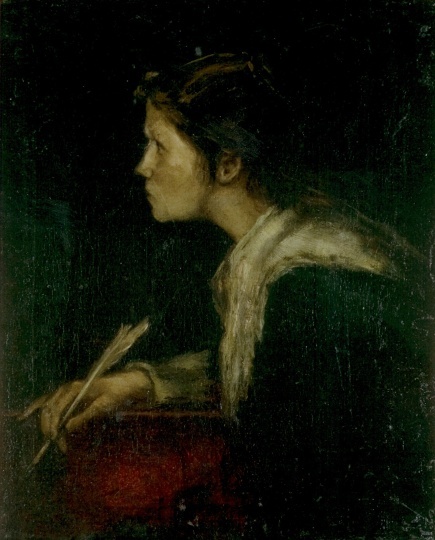 The young orphaned painter was helped by his uncle, the lawyer István Reök, who sent him to apprentice in 1855 to Mihály Lángi carpenter workshop. For the encouragement of Elek Szamossy he began to train himself. With the support of his patron the first half of 1865 he attended to the Vienna Academy of Fine Arts, but he left it a year later because of the high tuition fee. He returned to Pest where the “Magyarország” and the „Nagyvilág”, the „Hazánk” and the „Külföld” journals published his drawings. In 1867 allowing of his request József Eötvös Minister received 800 forint scholarships to him. In 1869 he began his major works, the “Condemned House”, and he won gold prize on the Paris Salon with it. In 1971 he moved to Paris, where he rented a studio. In 1873 he participated with five works on the Hungarian part of the World Exhibition in Vienna, and he got golden medal. In 1878 on the occasion of his “Milton” titled painting he received Iron Crown order and the diploma of nobility from I. Franz Joseph. He became World-famous with his “Condemned House” image, whose composition and representation are original and captivating. His Landscape painting and the pictures of Hungarian. 1878 On the World Exhibition in Paris he participated with the "Milton" titled painting, and he win the grand prize.